Apparently, Punxsutawney Phil (the world's most famous groundhog) saw his shadow today, which is supposed to mean 6 more weeks of winter. Well, I don't know much about the folklore but I do know that the Virginia General Assembly will be in session for 6 more weeks. We wrapped up day 17 of the House of Delegates and we have 23 more days to go. I'm sorry that I have been tardy in sending out these Richmond Reports, but things have been really busy down here in Richmond. Here are some updates for your information. First, I want to thank all the constituents who came to my first Town Hall meeting with State Senator Chap Petersen on Saturday, January 21. Although there was a layer of ice and snow on the roads, we had a great turnout at the American Legion Hall in Vienna. Big thanks to Town Councilmember Edythe Kelleher and the other members of Legion Post 180's Ladies Auxiliary who hosted this annual tradition of civic participation for our constituents. 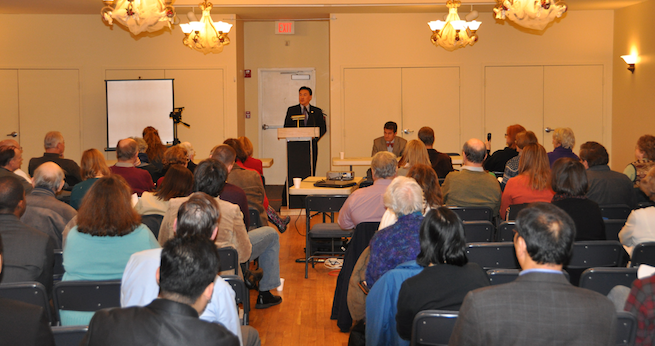 For those who missed it, here are some local news articles, photos and video clips about what we discussed at the town hall: Vienna/Oakton Connection and Vienna Patch. I'll be holding other public meetings in the coming weeks so please look for announcements as soon as we secure the dates and locations. As in previous sessions, I introduced numerous bills and budget amendments which have been moving through the law-making process. My House Bill 1123 has passed the Courts of Justice Committee and is currently on the House Floor. This bill is designed to save taxpayers money by ensuring that only eligible recipients receive certain state payments. Under current law, Virginia compensates those who may have been wrongfully incarcerated and who remain out of trouble. My bill would allow the State Treasurer to check the criminal history database to ensure that no one who is ineligible is receiving such payments. HB 1038 was rolled into a similar measure introduced by the Transportation Committee's Chairman. The bill would assess a higher fee for overweight or oversized trucks that cause much more damage to our roads than passenger vehicles. This bill passed the Transportation Committee unanimously and is now before the Appropriations Committee. Four of my bills did not do so well. With HB 1039, I fought to bring back 20% more transportation funds for repairing roads in the Town of Vienna because we have at least 20% more traffic than most other parts of the Commonwealth. Well, you could say that the Transportation Subcommittee members (most of whom don't live in Northern Virginia) didn't agree with my position! My HB 1045 would have reduced the amount of time that a home construction project has to be completed from 3 years to 2, in an effort to move along some of these long-stalled projects that create congestion, rubble, and all around eyesores in our neighborhoods. The Housing Subcommittee asked that we not legislate this requirement but instead work with the drafters of the Statewide Building Code to seek this change administratively. I introduced HB 1046 to clarify a section of the bill I successfully passed in 2011 to provide property tax relief to elderly and disabled homeowners. Through the Committee deliberations, we realized that the statute we adopted last year was clear enough so that no further amendment was necessary. Finally, my HB 1048 to seek the Miranda warning in language that an arrestee could understand was defeated by the Criminal Law Subcommittee. You can read more about this bill in an article in the Sun Gazette and the Herndon Patch. 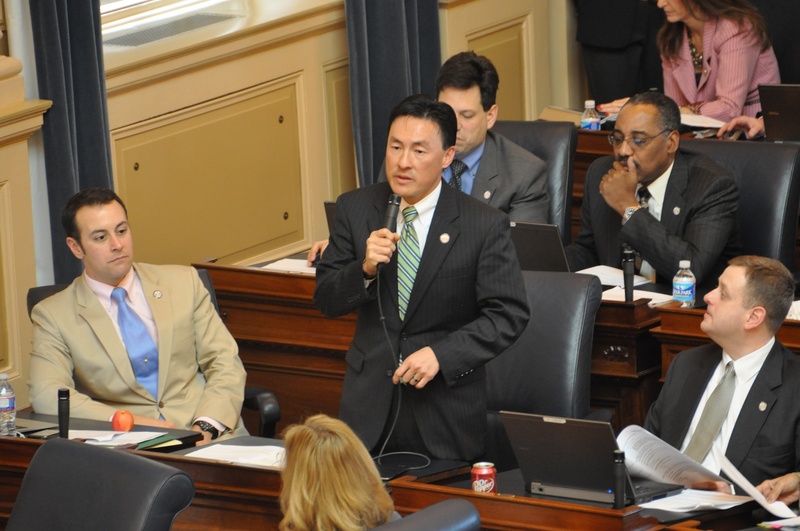 I also presented two amendments to the budget that would (1) provide five paid sick days per year for home healthcare workers, and (2) end the tax credits to coal industry that currently costs Virginia $31 million per year. As in every session of the General Assembly, we've already dealt with a host of controversial issues such as abortion, guns, religion, voting, immigration, labor unions, and school choice. While these social wedge issues generally grab headlines, rarely do these debates end up changing anyone's minds as votes usually fall along political party-lines or ideologies. You can see how I cast my votes by clicking here and searching for my name . I'm also happy to explain my views on any of these issues if you want to call or email my office. The next big issue we will address is the $85 billion biennial budget covering the Commonwealth's revenues and spending for 2012-2014. Due to the quirks of a single term Governorship in Virginia, this budget document is actually the first one that Governor Bob McDonnell has proposed as his own (the budget for the current years was originally proposed by outgoing former Governor Tim Kaine). Therefore, the budget debate will be a chance for this General Assembly — completely controlled by the Governor's political party — to decide whether we agree or disagree with Governor McDonnell's policy goals on education, public safety, transportation, pensions, and other core functions of the government. I will be sure to email you on this and other big issues as they develop down here in Richmond. In the meantime, please continue to stay in touch and follow me on Twitter and Facebook for more regular updates.